– The "Großer Mercedes" (large Mercedes) was the largest and most luxurious automobile ever built by Mercedes-Benz. – It was debuted at the 1930 Paris Motor Show where it was among the highlights of the day. – It set a new standard in the world of top-flight passenger cars for prospective customers, the public and the experts. – The bodies are built at the special M-B plant in Sindelfingen. 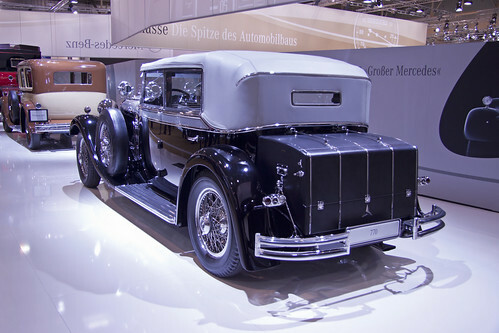 – It was the car to have as state vehicles for Kings, Monarchs, Popes and other high-ranking officials, like Reichspräsident von Hindenburg, Adolf Hitler, Kaiser Hirohito from Japan, Pope Pius XI and Pope Pius XII..
– The Roots type supercharger was an option, and only thirteen buyers opted for the naturally aspirated engine (150bhp). – It has a four-speed manual transmission (third was direct and fourth was an overdrive). – Of its successor, the 770 (W 150 Series II) (1938-1943) 88 built in total.